It’s been a long time since I’ve been authorized to advertise any Top Producer 8i sale prices on products but here it is. So far this is only effective until the end of September. The QR bundle – Top Producer 8i plus Market Snapshot – on sale for $84.95/mo. The Success Suite is the QR bundle plus a Top Producer Web site – that’s the lowest price I’ve seen yet at $99.95/mo. If you’ve been considering it, now is as good a time as any to give them a try. You pay up front for one month. (Paying a year advance gets you a 5% discount). If you don’t like any or all of them you can cancel within 30 days and get your money back. If you keep it beyond thirty days you are into a year contract and then month-to-month. What’s that you say? You don’t like a year contract? Neither do I but it is what it is and if you think about it, it shouldn’t be an issue – if you are committed to using a CRM. If you are not committed to get over the hump and learning how to use a CRM and sticking with it, then it is a big deal. You should wait until you are truly committed before getting any CRM. If you don’t, you’re just wasting your time and money. If you have made the decision to pick a CRM and stick with it until you get over the hump, then go for it. If you stick with I promise you you’ll be glad you did. Call me at 215.345.5222. What’s with all the negative PR on Top Producer? Also note that if you are reading comments online about Top Producer, is there a date on them? Top Producer has been around since 1989. There are volumes of very old comments and opinions that are about issues that have not existed for years. Many comments have no date on them. Until the last couple years I was not recommending Top Producer very often because I felt there were still too many holes in the feature set. That is no longer the case. What prompted this post is that it is not uncommon now for me to recommend Top Producer to someone and get a reaction along the lines of “I don’t know, I’ve heard a lot of bad things about Top Producer.” I then have to explain to them why they probably have that perception. Some of it is from online. Some of it is from personal comments. Let’s look at some of the reasons Top Producer has come under fire over the years. Before we get into past reasons, let’s look at the top two current reasons. It’s not too complicated. It is simply more than the person who is making the statement wants. There is a big difference. Far and away the biggest reason for this complicated statement is that the majority of agents don’t want much. They really don’t want much more than a glorified Rolodex. They get Top Producer and say it’s far too complicated. It is not too complicated for everyone. It is too complicated for the person who doesn’t want or need it, or is intimidated by it. The sad part is that if they learned to use most of the features available in it, they would dramatically improve almost every aspect of their business and make much more money in less time. But you can lead a horse to water… So the It’s too complicated” statement is only true if you want a simple CRM. What comes hand-in-hand with that comment is that the learning curve is very steep. It does take a while to learn it, but not because it is difficult, but rather that there is a lot to it. The first time you wrote a letter in MS Word it wasn’t that tough to learn right? But what if you wanted to learn everything there is to know about Word? How long would it take? Does that mean you should stay away from Word because the learning curve is too steep? No, it just means that both Top Producer and Word take a while to learn if you want to master all of it. 2) It’s too expensive. The least expensive real estate CRM is $99/yr. It’s a one or two person company though so is the price worth the risk? Time will tell. The next cheapest that is relatively comparable in features is $25/mo. The next is $35/mo. and there are several that are $80 – $90/mo. Top Producer is $35-40/mo. Top Producer is as good a bang for the buck as any CRM out there. CRMs are pretty much all online now and they charge a monthly fee. Running most of your business with one software product that costs $35/mo. is pretty darn cheap. Other industries would laugh at us complaining about pricing like that. Then I hear “Yeah but if I have two other agents and two assistants it costs $125/mo.” Uh, yeah, but if you have a team of five, how much money are you making? What percentage of your monthly income is $125? And by the way, how much do you spend a month on your car? Everyone has understandably been in cost cutting mode for some years now, but CRM has always been a money maker when used correctly. I have no problem saying it is impossible not do at least one extra deal as a result of the organization and follow up that comes with using a CRM. And then you have people who say “I want a CRM that does A, B, C, E, F , G, H, I and J, but I don’t want D, so why should I pay for D.” If you want all the bells and whistles except one, you get a powerful CRM with all the bells and whistles. That’s like saying I want a top of the line Mercedes but I don’t want cruise control. Too bad. You’re getting it. If you don’t want it, don’t use it. But when did it become popular to beat up on Top Producer and why? It all started when they moved from a desktop application to web based! How dare they! I know I’m going to make some enemies here but please. Time marches on. Virtually all software is moving online. There were more people using Top Producer 6i (the last desktop version) than any other Real Estate CRM. They spent good money on it, some over a period of almost 15 years. But when Top Producer decided to move to the Web and charge a monthly fee, many people went ballistic and started spewing venom about Top Producer online and it lasted for years. It was of a magnitude the likes of which I have never seen. The reality is that Top Producer took care of those 6i users for three or four years after they stopped selling it. Over ten years later there are still people using it, and they are no doubt unhappy campers that it is no longer supported. Quickbooks stopped supporting my version three years after I got it and that wasn’t even because they went online. they just do it routinely. I wasn’t happy but I didn’t go online and do my best to make it sound like Quickbooks were a bunch of crooks. So that was the first negative barrage about Top Producer online. Once Top Prodcuer went online the infamous mantra of they hold your data hostage began. I have written pages just on this misconception alone but I’ll keep it short. The reality of this one is that they exported 236 fields, more than any other CRM at the time and still more than most. 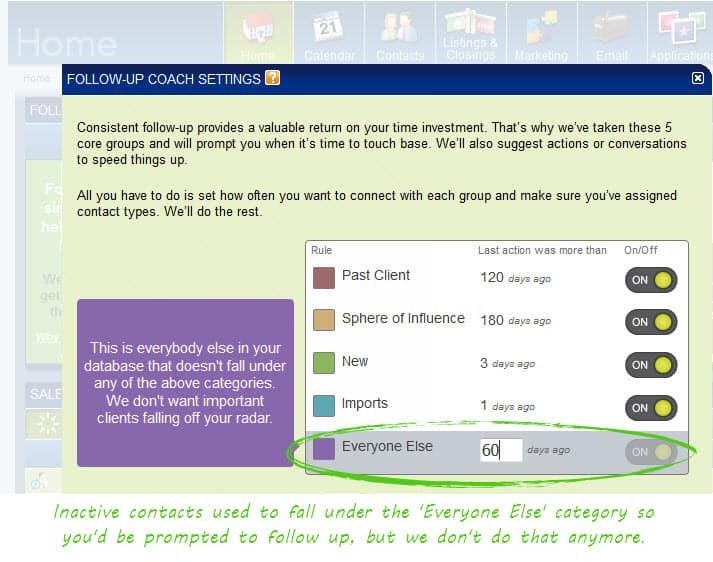 The real issue was that no other CRM could import more than just the contact information. The kicker is that that is true of virtually all CRMs. They usually just don’t import more than the contact fields so every time you move from one CRM to another, you lose all the transaction history, letter and e-mail templates, and a good deal of other information. So this issue was never specific to Top Producer, but because they had far more users than all the rest of the CRMs combined, they were the ones that were nailed for it. There will be people out there who will argue the finer details of these statements, but the bottom line is that all CRMs have the same issues with regards to this. They dramatically changed their interface when it changed from version 7i to 8i. A lot of people did not like that. I agree that it was a mistake by Top Producer to change the interface so dramatically, but in it’s defense, they did so because they they had to re-design it to accommodate a better product in the long run. There are still many users on 7i despite the fact that there is so much more that 8i does. People don’t like change, so they went online by the scores and complained. Initially 8i was said to not be intuitive and I would have to agree. It was also said to be difficult to use, meaning it took too many clicks to accomplish simple tasks. This was also true to a degree. They made a lot of changes over the last couple years. Now – I find it to be as intuitive as any of them in most cases. I also no longer agree that it is difficult to use. I routinely ask people to be specific when they say that. Most never answer. 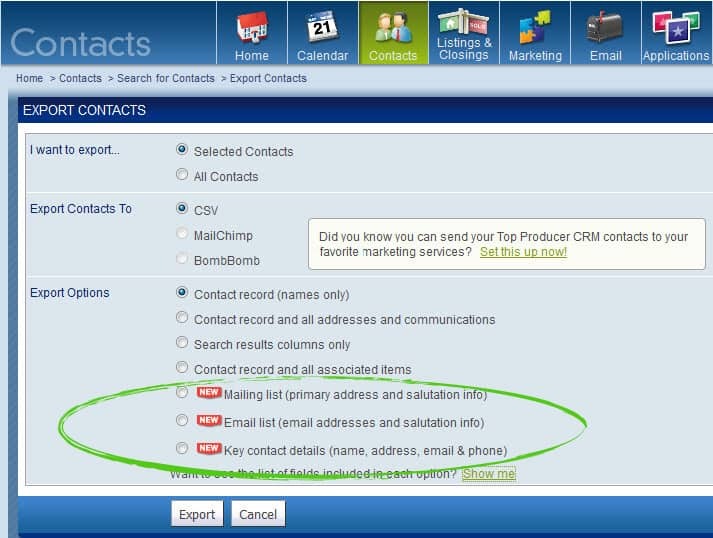 Recently one person answered and said that “it takes too many clicks to add a contact”. I counted. It was two. I think these kind of complaints come primarily from people who have never used a CRM before and have no perspective with which to evaluate what they have. Or if you have used one and it was a much simpler one, of course a much more powerful one will take more clicks in some cases. Another criticism that used to be true was that it was too slow. That also used to be true. I recently ran some time tests against it’s three primary competitors. It was as fast as the rest, and faster than one. Here’s another one that’s been around for years. This is the one that is the most insidious because they have an agenda and you don’t know it because they don’t tell you. The scenario is this. An agent gets Top Producer to trial it. You have to actually purchase it to try it. They bill your card for the first months fee. You then get 30 days to decide whether or not you want to keep it. If you cancel within 30 days you get your money back. If you do not cancel within 30 days they will hold you to the contract. What commonly happens is that an agent gets the trial and knows they have 30 days and are then into a year contract. But then they get busy and forget about it. 70 days later they call and want to cancel. TP won’t let them. They get irate and go online and start spewing anything negative they can think of about Top Producer. Is the year contract antiquated in Top Producer’s competitor’s market? Sure. But is the agent in the wrong, or Top Producer? Clearly the agent is blaming Top Producer for their own mistake. Remember this when you are reading online comments about Top Producer. And finally, Top Producer has never been one to spend money on a person to monitor and respond to online statements and criticisms. They still don’t. Take the seven year old comment that says “I tried Top Producer but it’s way too slow.” If Top Producer had a social media manager, they would come across this comment and could respond and say “Unfortunately we did have an issue with speed seven years ago, but it has long since been resolved. I’ll be happy to demonstrate it to you by showing it to you live if you like!” It is in my opinion that it is exponentially more expensive to ignore the problem than it would be to pay someone to prevent it. Had they proactively responded to criticisms as they had been made for the last decade online, they would most certainly enjoy a more favorable reputation than they do now. It has been common place for a few years now for companies to have someone who does just that. It’s a shame. As is usually the case, people are generally more likely to get angry and go online and complain than they are to be happy and go on and praise. There have been plenty of happy Top Producer users over the years that you just don’t hear from. Maybe they’re too happy and busy making more money to bother. Bear in mind that it is inevitable that you will see more comments both positive and negative about Top Producer than most or all of the other CRMs combined. Why? Because they have had more users than all the rest combined for most if not all of the years since it came out. P.S. – Although I enjoy sharing this kind of information, I also need to make a living. If this article has prompted you to take a look at Top Producer or any other CRM, please do me the kindness of contacting me or visiting my site to trial or purchase them. As always, I can not be beat on price or terms on any of the 30+ CRMs on my site. https://garydavidhall.com/wp-content/uploads/2015/02/GDHLogo340.jpg 0 0 Gary David Hall https://garydavidhall.com/wp-content/uploads/2015/02/GDHLogo340.jpg Gary David Hall2013-08-08 08:50:222015-01-27 11:22:58What's with all the negative PR on Top Producer? I’ve been pushing them to add the capability to store documents in the CRM for years, but the response was always that they had too many users and that it would take too much server space. Since that is no longer an issue, – Voila! Where is the “one” best Top Producer User Group? I have never found the “one” forum/user group to go to for Top Producer users that had a lot of good activity. The one on Active Rain gets very little participation. The one TP provides does not get used. Not sure why. They probably simply do not promote it enough. I am going to try to provide it for you TP users. I have created a Community for Real Estate CRMs here in the form of a Forum for each product. If you are a Top Producer user, please go to the forum and ask a question or state a need. Please subscribe and lets get it rolling so there is somewhere comprehensive for TP users to go. I am announcing this on many other venues across the net so let’s see what happens! https://garydavidhall.com/wp-content/uploads/2015/02/GDHLogo340.jpg 0 0 Gary David Hall https://garydavidhall.com/wp-content/uploads/2015/02/GDHLogo340.jpg Gary David Hall2013-03-05 12:38:042015-02-24 21:38:29Where is the "one" best Top Producer User Group? Is Top Producer a good value? I posted this in another spot and then decided to post it here as well. I would like to comment on the cost of TP. I want to be clear that I am not addressing any faults it may have, as all of the CRMs have faults. I am solely addressing cost. Bear in mind that while I am a reseller for Top Producer, I am also a reseller for almost 30 other Real Estate specific CRMs. There is no “Best CRM”. There is only the best one for your individual needs. A common characterization agents make is “I am paying $100 or $200 for Top Producer and it is too much.” Lets first be clear that no one pays more than $39.95/mo. for TP8i. If you are paying TP, the company, more than that, it is because you are paying for additional products in addition to the CRM, or are paying for multiple licenses. Phone synching, Outlook Connector, Web sites, IDX, Market Snapshot, and so on are additional products, for which you would have to pay a separate amount in any case. There are exceptions, but typically not when you compare apples to apples. To say for instance that ABC CRM does not charge for phone synching, when in fact it is done through Outlook, that is not the same function, and should not be considered as the phone synch being the same function and being free. Having a mobile app to provide access to a WAP enabled site, and that being included, is also not the same function. Apples to apples. With regards to the price of Top Producer, it is often a topic of criticism, but I have to say that if you compare the value of TP to all the others, it is very much worth the bang for the buck – for a single agent. $40/mo. gets you unlimited phone support, free bulk e-mailing, more templated content and plans than any other CRM on the market, Social Media interaction from within the contact screen, Realtor.com interaction to display properties for that contact’s address on an interactive map, and the ability to invite the client to see a private status page online, to name a few. What is also virtually never credited as an added value is the extensive number of vertical market products with which it has a relationship. One of the primary functions of a CRM is to enable the agent to be more efficient. If one CRM enables you to eliminate redundant data entry to multiple products, it eliminates a great deal of wasted time, adding significant value. What many agents who criticize the cost fail to disclose is that they do not use much of what it offers. If you do not, then it is indeed not a good value for you, and another solution is needed. The value to which I refer is ony a value if you use it. I have many other CRMs that suit varying needs if you’re not going to make use of what it offers. With regards to the cost for teams requiring multiple licenses, I have told TP on many occasions that I feel they need to scale the cost as more licenses are acquired for a team. It is not as good a value when you are paying for multiple licenses. That said, if a team consists of 4 or 6 or 8 people, that means you are making a very significant income, and the cost of the licenses becomes a cost of doing business that is difficult to match with other products based on its value, if you use it. I have other solutions that are more cost effective for teams, but they do not provide the same value. Additionally, if you go outside the industry and look at generic CRMs, you will find that they are much more expensive, and most of the “biggies” like ACT!, Goldmine, SalesForce, Maximizer, etc. , do not even want to deal with individuals, as opposed to companies. So all in all, TP may cost more than some, but if you use the tools it provides, my opinion is that it is a good value. https://garydavidhall.com/wp-content/uploads/2015/02/GDHLogo340.jpg 0 0 Gary David Hall https://garydavidhall.com/wp-content/uploads/2015/02/GDHLogo340.jpg Gary David Hall2011-12-03 19:17:222014-06-05 19:18:40Is Top Producer a good value? Purchase 8i plus the choice of a Smartphone App. (iPhone or Blackberry) for only $41.95/month! Or 8i only for $35.95/mo. This offer CANNOT be combined with ANY OTHER OFFERS for 8i and only available on the package. This offer cannot be applied to 8i in other product bundles. To purchase at the discounted special price – click here and place your order, or just call me. The store does not reflect the special price for 8i and the phone, but it will be adjusted. https://garydavidhall.com/wp-content/uploads/2015/02/GDHLogo340.jpg 0 0 Gary David Hall https://garydavidhall.com/wp-content/uploads/2015/02/GDHLogo340.jpg Gary David Hall2011-07-13 15:51:102014-06-05 15:52:07Top Producer Special Offer!